9th-8th century BC : First Phoenicians, Jews and Greeks arrive in Portugal. 3th-2th century BC : Beginning of Roman colonization. 2th century AC : First Hispanic-roman Christian communities. 5th-7th century : Suebi and Visigoth kingdoms (Christians, Visigoths were Arian Christians). 711 : Arabic invasion and cultural settlement. Resistance of the Kingdom of Asturias in the Northern of Peninsula (comprising Northern Portugal). 8th-15th century : Christian Reconquista (reconquest). 12th century : Foundation of the Portuguese kingdom (1179 – papal edict Manifestis probatum). 1496/97 : Forced conversion of Jews to Catholicism. 1536 : Foundation of the Inquisition in Portugal. 1820 : Liberal Revolution and beginning of the Constitutional monarchy (inspired by the French Revolution, and British and American constitutionalism). 1821 : Inquisition is banished from Portugal. 1822 Constitution : separation of legislative, executive and judicial powers. “The Religion of the Portuguese Nation is Roman Apostolic Catholic. But foreigners are allowed to have their religious services in private” (article 25º). 1910 : Republican Revolution and secularisation of Portugal. 1911 : Law of the Separation between State and Church. Religious Freedom for protestant communities settled since the 19th century, as well as for other groups arrived later like Kardecist Spiritualists. 1926 : Revolution of the 28th of May – military dictatorship based on a presidential, authoritarian and anti-parliamentary conception of the state. It is in the origin of “Estado Novo”. Salazar becomes minister of Finances in 1928. 1932 : Beginning of "Estado Novo", Salazar’s dictatorship "April’s Revolution". 1933 Constitution : maintains the division of Church and State, but declares the Catholic identity and moral values of the Portuguese nation, affecting minority religious groups (Spiritualists and Jehovah Witnesses are persecuted). 1940 : Concordat and Missionary Agreement between the Portuguese State and the Holy See. 1961 : Beginning of the Colonial War. As a consequence, the relations with the Vatican became tense, and some Catholic sectors oppose to the regime. 1971 : First Law of Religious Freedom (after Salazar’s death and in a less rigid period). 1974 : "April’s Revolution and instauration of the democratic regime. 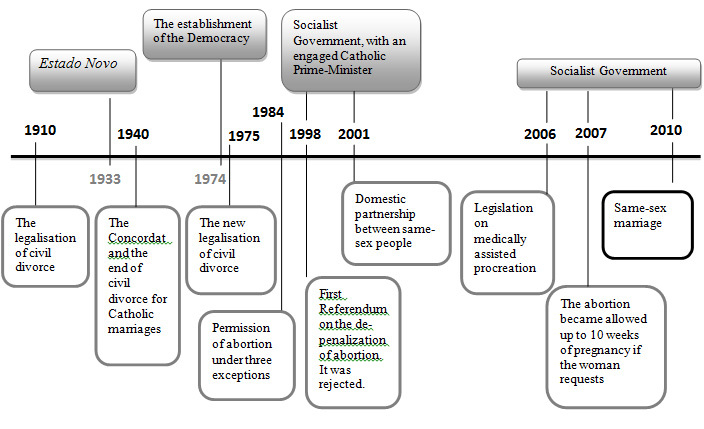 1976 : Democratic Constitution. It affirms the neutrality of the state in matters of religion, and establishes religious freedom at both the individual and collective level. 2001 : New Law of Religious Freedom approved in parliament. 2004 : New Concordat between Portugal and Holy See.